1) Free printable spring time subway art as DIY wall decoration from smile like you mean it. 2) Free printable spring subway art for DIY entry decoration and the smaller version as springtime gift tags from the 36th avenue. 3) Free printable floral spring DIY paper bunting from poulette magique. 4) Free printable adorably patterned spring-has-sprung bunting for DIY front door or wall decoration from tatertots and jello. 5) Free printable spring banner with pink bird from she's kind a crafty. 6) Free printable girly pink scrapbooking paper with flower, tree and blossom doodles from activity village. 7) Free printable hello spring wall art (+ 5 other spring printables) from what ever deedee wants. 8) Free printable shabby rose paper stripes for DIY paper chain garlands from all sorts. 9) Free printable adorable floral bookplates from lilyashbury. 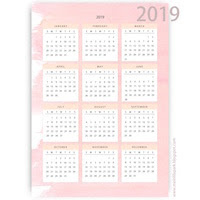 10) Free printable spring-is-in-the-air to-do lists from miss modish. 11) Free printable spring-has-sprung card for DIY decorations from itsybitsy paper blog. 12) Free printable pastel colored spring journaling cards with cute kawaii flower and bunny (perfect as bookplates for little girls ^^) from coeur de beurre. 13) Free printable light blue and candy colored happy spring cards and circle tags with cute singing bird graphic from living locust. 14) Free printable pastel colored happy-spring gift tags from the latest find. 15) Free printable spring daisy flower note cards from lilac n lavender. 16) Free printable spring place cards, napkin rings and art sign (spring, bloom, grow, shine) from hoosier home made. 17) Free printable butterfly mobile paper craft for children rooms and nursery from spoonful. 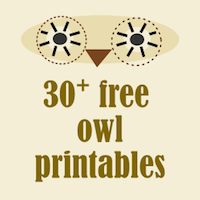 18) Free printable bird mobile paper craft for kids from spoonful. 19) Free printable watercolor butterflies (+ tutorial for DIY spring decoration) from elli. 21) Free printable bird and flower cake toppers (perfect for children parties or baby showers) from the pretty blog. (For the download you'll have to register). 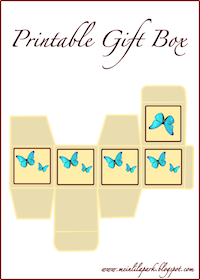 22) Free printable blue butterfly gift box from me in lila park. 23) Free printable flower scrapbooking and wrapping paper from me in lila park. 24) Free printable butterfly scrapbooking and wrapping papers from me in lila park. 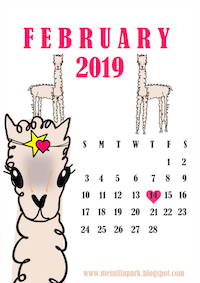 25) Free printable pink vintage rose journaling cards from me in lila park. 26) Free printable birds for DIY mobile and spring garlands from me in lila park. 27) Free printable borders with flowers, bees, birds, cats and pigs from me in lila park. 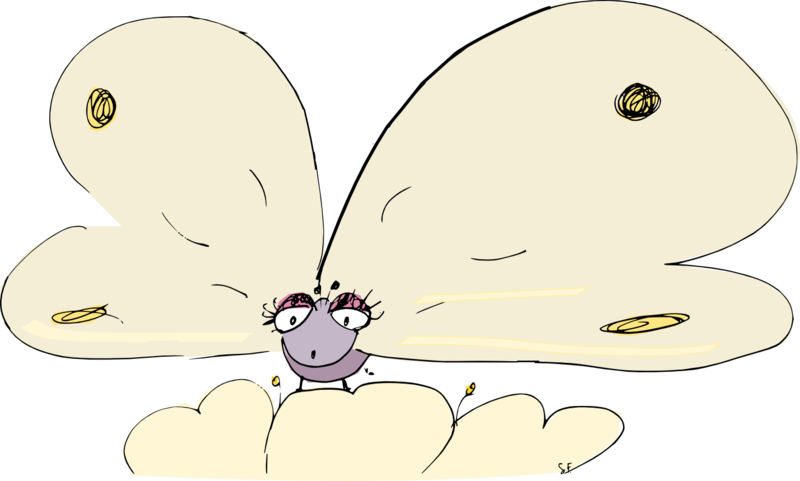 28) Free printable butterflies for DIY mobile, spring garlands and other spring time decorations from me in lila park. 29) Free printable spring doodle fun scrapbooking and wrapping paper from me in lila park. 30) Free printable butterfly lady scrapbooking paper and embellishment from me in lila park. 31) Free printable red poppy flower scrapbooking and wrapping paper from me in lila park. 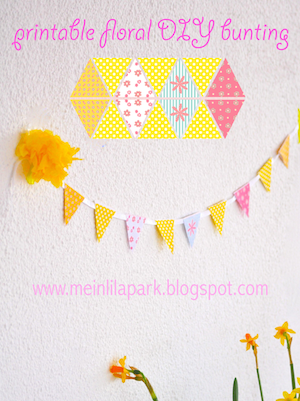 32) Free printable spring bunting with polka dot and floral patterns from me in lila park. Hallo liebe Besucher von MeinLilaPark! Hier habe ich euch eine Sammlung kostenlos ausdruckbarer Frühlings-Druckvorlagen zusammengestellt. Es sind Poster, DIY Girlanden, Buchetiketten mit wundervollem Blumenmuster, To-Do Listen, Karten, ein DIY Schmetterlings-Mobile und ein DIY Vogel-Mobile dabei.